The artwork, created by world-renowned artists 3D Joe and Max, is a re-creation of the iconic Death Star trench run from Star Wars: A New Hope, and is featured in the Rise Against the Empire Play Set out Friday 2nd October, which features iconic moments from the original Star Wars trilogy. 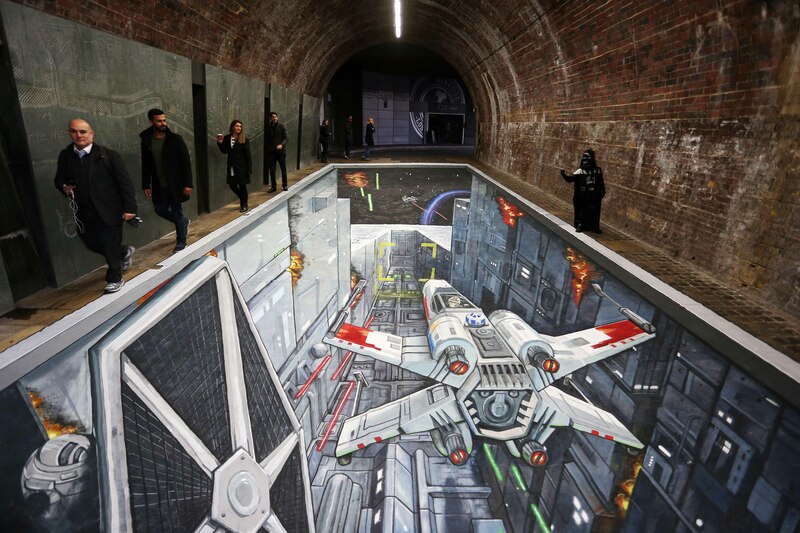 Located a few minutes’ walk from London Bridge Station and Shakespeare’s Globe Theatre on Bankside, the artwork stretched 15 metres along the walkway underneath Southwark Bridge, complete with sounds effects of ships, laser fire and droids. Disney Infinity 3.0 is the latest installment in the highly successful “toys-to-life” franchise, bringing together characters from across The Walt Disney Company for the ultimate family gaming experience. The Star Wars Rise Against the Empire Play Set allows fans to embark on galaxy-spanning missions with legendary Jedi Luke Skywalker, Rebel leader Princess Leia Organa, heroic smuggler Han Solo and his trusty co-pilot Chewbacca to help defeat Darth Vader and overthrow the evil Galactic Empire. Featuring non-stop action, players can explore open world planets like Tatooine on foot or on a Bantha, take down AT-AT walkers aboard a snowspeeder on Hoth, out-maneuver stormtroopers on a speeder bike on Endor, and partake in epic space battles in an X-wing Starfighter to destroy the Death Star. Disney Infinity 3.0: Play Without Limits is rated PEGI 7 and developed by Avalanche Software in partnership with Ninja Theory, Sumo Digital, Studio Gobo and United Front Games. A Disney Infinity 3.0 Play Set based on Star Wars(tm): The Force Awakens will also be available later this year, as well as additional Star Wars character figures and Power Discs.